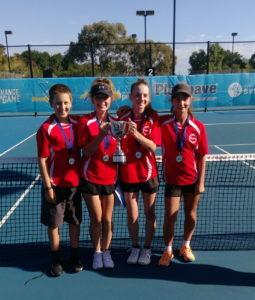 Nejta selected Plenty tennis club players Abbey Rumble, Bridget Heczey, Zac Heczey and Isabella Markovski along with twelve other juniors from Nejta clubs to represent the association in the Pat Cash cup. The event was played at Bendigo tennis centre on February 24 and 25 and contested by ten other association from all over the state. The Nejta team did a tremendous job winning the event. All the players showed great team spirit and sportsmanship. Well done team(especially the Plenty players). Copyright © PLENTY TENNIS CLUB All Rights Reserved.